Not sure where to start gathering ideas? Do you offer trial appointments? Absolutely! If you're looking for book a trial, we recommend scheduling a "preview appointment" for at least 3-6+ months or so before the event. 3 months works best for those brides who've already completed a contract, while 6 months or more is ideal for those brides who'd like to try the services before committing. Depending on the time of year, we may not have availability for a preview with less then 3 months notice. What's the best day for the appointment and how much time should I allot? We generally schedule all preview appointment for Sundays at our studio space in Farmington. Our preview appointments are about 60-75 min per service, with the goal of showing you a few options. Do I really need to do a preview appointment? This is especially tricky for out of town or admittedly very low maintenance brides and clients. A preview just gives you a great idea of what you'll look like on the day of the event, if you like more or less makeup in general, and how it will feel and last throughout the night. Think of it as a tasting menu-- you get to sample different ideas, and then make any edits before the big day. If I schedule a preview appointment, will you automatically hold my appointment date? Please note that we only will hold a wedding appointment date for the 24 hours following your preview appointment. Your $100 retainer will hold your appointment until your trial, but a signed contract is still required within 24 hours. The retainer is non refundable. Please be conservative in the number of services you request for your Bridal Services Contract-- it is way easier to just add needed services as we get closer to your date, vs. over committing early on, and end up paying for more services than you actually need. Please note that your retainer payment is required to hold your trial appointment and your signed contract confirms booking. The final payment is due 7 days before your event date. If your bridal party members are paying for their services, they would need to make arrangements in advance to reimburse you. Is there a minimum number of services required for a wedding or event appointment? It depends on the time of year. From May 1st - November 1st, we require a 4 service minimum per team artist/stylist for an appointment. For the rest of the year, we may be able to offer Bride Only services. Please inquire! Lead artist Robbin requires a 4 service minimum year round. If you end up having a larger group seeking 7 or more beauty services, our Flat Rate options might work better for you. 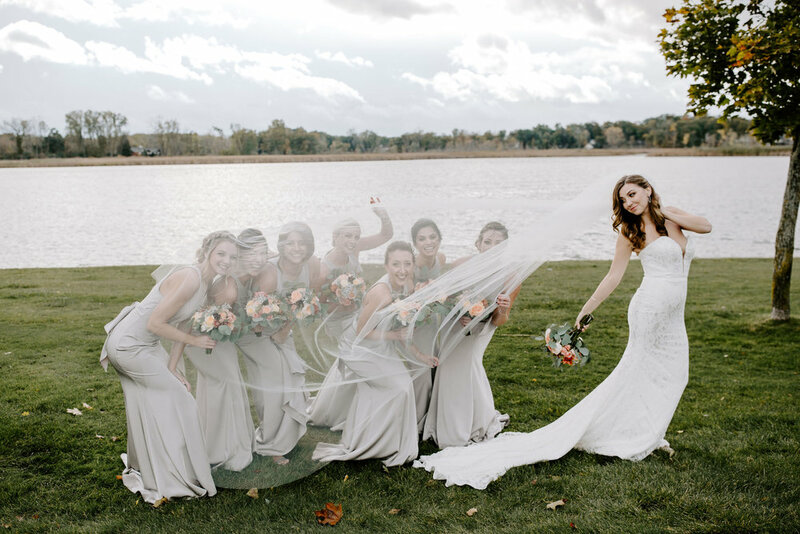 Our bridal team 5-hour option for $950 is the most popular, and includes any makeup, temporary eyelash, or hair services (with select artists) requested, as well as the bride's services . Makeup applications and hair services generally take 35-50 minutes per person, so this rate includes a maximum of 8 services. Do you travel for on-location services? We absolutely will come to your location-- you'll have enough to do that morning as is! All parking/valet fees and travel arrangements are the responsibility of the client. We do need to know your general appointment time at the time of your appointment booking. The client is responsible for all parking/valet fees for the event. Each artist often has 1-3 kit bags, and sometimes also beauty lights and a chair in tow, so if your location offers valet parking, that's the option our team uses in order to get to you as quickly as possible. Unless other payment arrangements have been made, all parking and taxi costs are to be paid at the time of service directly to the artist, or charged to the credit card on file. Our bridal teams travel fee starts at $50 for appointments 30 miles or more from 48393. Travel to Detroit is $50. Do you work with destination events and weddings? We love destination weddings! The logistics for these events can be more complex, so please email us with your info and details, and we'll work with you to set up the best appointment. In addition to our destination travel fees, we require airfare and accommodations to be provided for the event. Depending on the location and artist, there may be additional fees for accommodations, and transportation costs.